Maces continued to be used beyond the end of the medieval era. Post-medieval maces were usually a cavalry weapon, and often an officer�s symbol. They were widely used by the Ottomans, Hungarians, and throughout Indo-Persian areas. Maces were also in use in Russia, Ukraine, India and China. A detailed history of post-medieval maces is outside my expertise and interest. Typical of Ottoman Turkish design, this mace has a long metal neck which sheaths the upper part of the haft. The mace is from Sarajevo, Bosnia. The wooden haft is a late-19th or early 20th century replacement. These maces were used by Ottoman Janissery and Sipahi officers and was both a weapon and a symbol of rank. This mace head is 7.1cm wide and 5.8 cm tall (7.2cm with the finial). 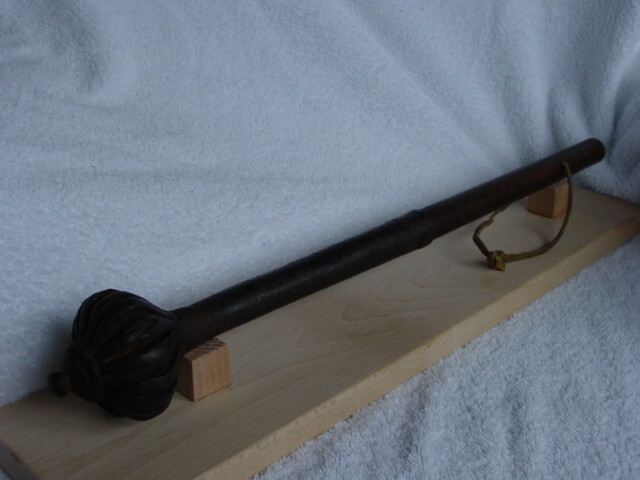 With the metal neck, but not the wooden handle, the mace is 28.5cm overall. The wooden haft is 2.6cm in diameter and the neck is 2.2mm thick. The head has 15 flanges plus space for one that has broken off. The flanges are 5.65 cm long, 2.3cm high and 6-7mm thick (tapering to 4-5mm). It is 0.84kg (1.8 lbs) with the wooden haft. It is made of bronze. 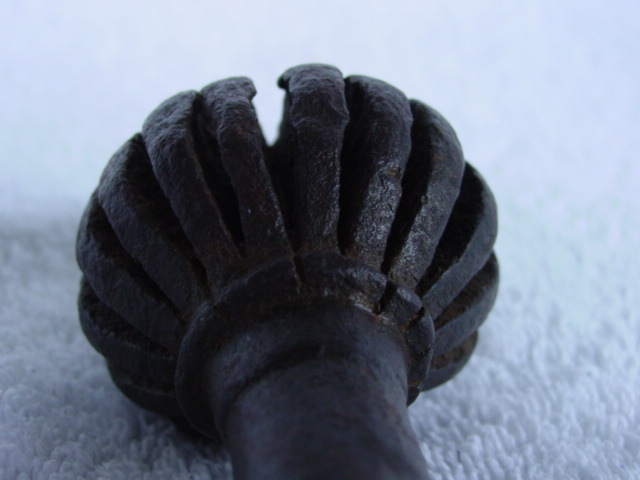 Close-up view of the top of the same mace showing the tightly packed flange arrangement and the separate finial piece. This mace is very similar to the one shown above. The head is smaller and rounder than the previously illustrated mace. This is indicative of a slightly later date. The mace is from Croatia. 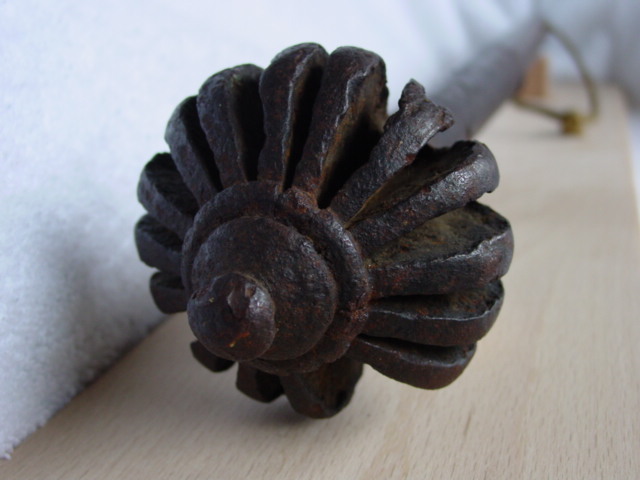 This mace head is 5.7cm wide and 5.0 cm tall. With the metal neck the mace is 22.5cm overall. The neck takes a haft of 2.0cm in diameter and is 1.7mm thick. The neck is actually 13-sided, not round. The head has 15 flanges plus space for one that has broken off. The flanges are 5.0 cm long, 2.0cm high and 5-6mm thick (tapering to 3-3.5mm). It is 0.41kg (0.9 lbs). It is made of bronze. 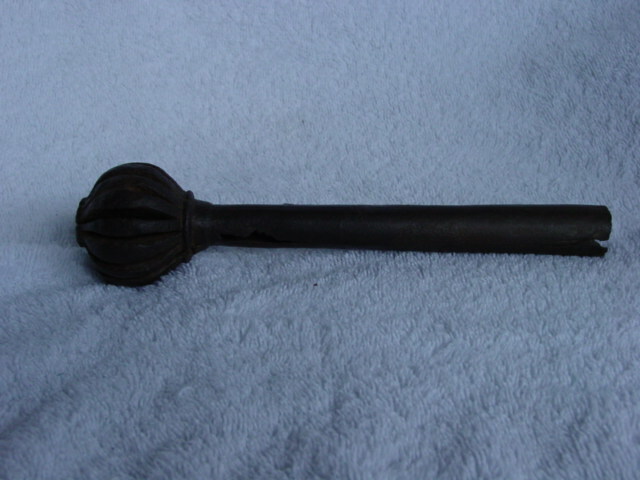 Close-up view of the bottom of the same mace showing the flange arrangement. The flanges are packed so tightly that there is little space between them. Though still a buzdovan (flanged Ottoman mace) this example has almost become the same as the topuz (solid-head Ottoman mace). 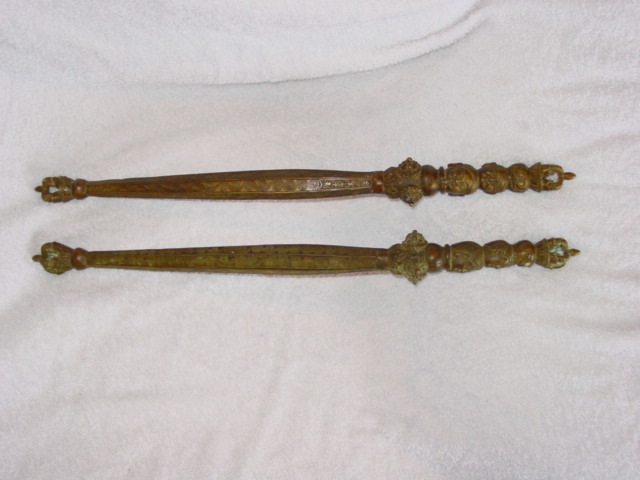 This pair of Chinese bronze maces are reportedly of late Qing dynasty (late 19th or early 20th century) but are of questionable authenticity. It is hard to authenticate an item which is only around 100 years old if genuine. These maces are 51 cm long (17.2 cm �hilt� and 33.8 cm stick�). They weigh 0.75 kg (1.65 lbs) each. 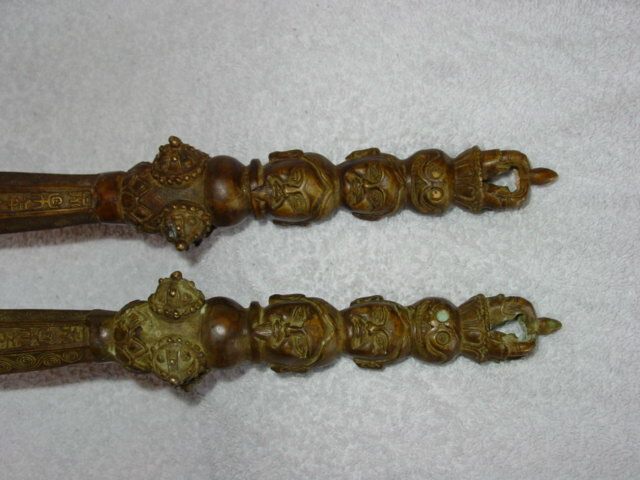 These stick maces are a type common in post-medieval China. They are one piece hollow bronze and are meant more as symbols of authority than weapons. This close up shows the handles which are comprised of a human head and skull design. 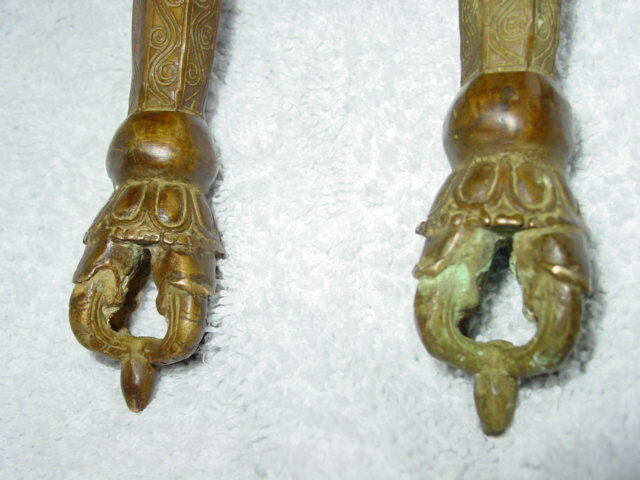 A close up of the �claws� at each end of the maces. 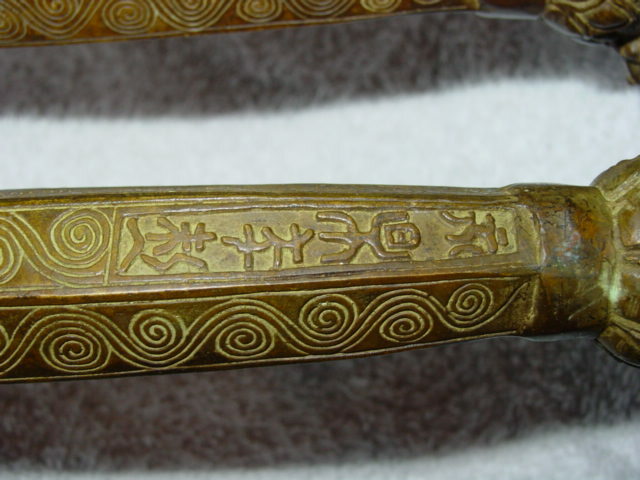 A close up of the Chinese characters just above the hilt of the maces.